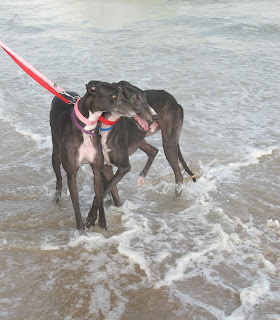 Greyhound Fairytales: Ana & Blue Reach the Beach! Ana & Blue Reach the Beach! Kenney and I took the kids up to Delaware last weekend for Greyhounds Reach the Beach. It was about a 4 hour trip up to his mom's house in Delware on Friday, and then we drove to Rehobeth & Dewey beaches on Saturday. That leg of the trip was about an hour and a half, but it was a straight shot all the way there- the road just becomes the "main strip". We got there mid-afternoon, and we thought we would start in Rehobeth at the firehouse. It was amazing to see so many greyhounds sauntering about with their people. We were stopped numerous times & asked why there were so many greyhounds around! The standard retired racers were present and there also was a presence of the Iggys- their little back legs look so funny without any hammies!! Annie, our foodie, was a little overwhelmed by all of the boardwalk scents- and I don't think she ever quite figured out why there were so many greyhounds around! She would sniff a few, but then I think it was sensory overload, and she just clung to her people after that. This is Annie by some dunes on the boardwalk eye-balling some other greys. It was a pretty warm day, but a lot of the local business owners put out water and biscuits for the pups. Ana refused to drink or eat from the "common bowls", and would only drink when we went to the water fountain and filled her portable bowl...which we then had to carry around wet, but she was ok with that. Then we drove the mile or so to Dewey Beach! This was the first time our kids have been to a beach, and we were so excited to see what they were going to think of it! This was the site that greeted us when we walked onto the beach...if you look REALLY close, all of those specs are greyhounds with their people!! Blue was like- WHOA! Do you see those greyhounds, mommy? What are they doing HERE? As we have found is his way, Blue sized up the water before he would approach. Blue's footprint in the sand. Hmmm....what is this frothy stuff?? I think it's safe... What the $#%&!!!! Ana wasn't sure about the water- she didn't understand why it kept trying to touch her! Ana got some kisses from her daddy when she made it back to the safety of the dry sand. When I walked her out to the water, she kept turning her head around to look at Kenney like, Do you SEE what she is making me do?!?! Looks like you guys enjoyed your first Reach the Beach with the kids. No rain or hurricane to ruin the experience.